The town of Llanberis in North Wales is the starting point for people wishing to journey to the summit of the country’s tallest mountain Snowdon (3560ft). 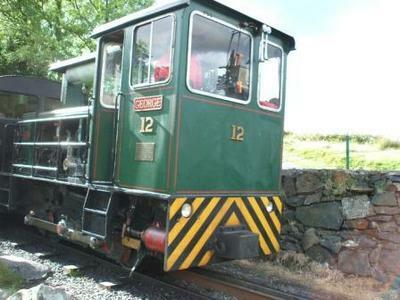 You can either take a strenuous hike to the top or a ride on the rack and pinion steam railway opened in 1896. 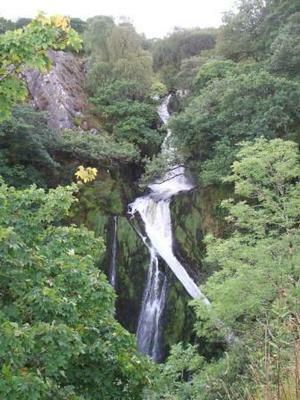 If you follow the road behind the station and then the steep footpath you will eventually come to the waterfall Ceunant Mawr which translates as the waterfall of the great ravine. It plunges in two stages over one hundred feet into a gorge with the main body of water on the lower fall being channeled diagonally along a rock shelf. It is necessary to cross the rail tracks to get to the only viewpoint which is frustratingly obscured by trees. The best view is glimpsed from the train as it crosses a viaduct above the river.